Happy New Year everyone!! So happy to be back at it . . . I’m looking forward to catching up on your blog postings. During the break I did a little painting, drawing, researched art techniques, and learned how to bake bread (on my 8th loaf, getting there and love the process). It was good to be away – I feel refreshed and ready to go. 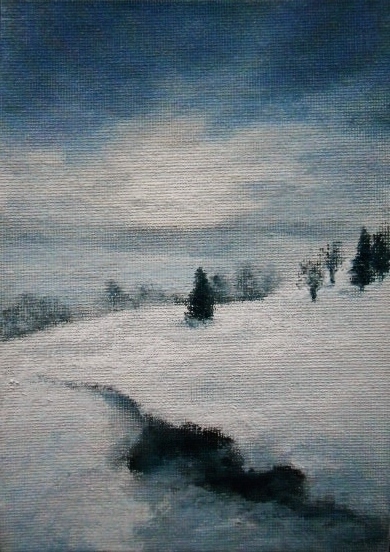 A little painting I did over the break, was this 7×5 winter scene I call, Snowy Hillside. I used artist canvas board as the surface and mostly Sennelier Oil Pastels (these sticks are greasy and buttery, just like painting with lipstick). I started with a reference image, then reversed the image – added a few trees, a stream and well, kind of injected a different atmosphere to the scene. Hope you enjoy . . . those in the US who are getting hit with a snow storm, you probably don’t need any reminder of how cold it is out there. The reference image was taken by Vanessa Cooper, a photographer with pmp. This entry was posted in About Oil Pastels, OPs New Paintings and tagged Oil Pastel, snow, trees. Bookmark the permalink. Such a lovely painting. I am an artist of sorts, generally with acrylics/watercolors. I find oil intimidating and hard to work with. I am very impressed with your use of this medium , it is lovely. Nice to meet you and thanks very much for your kind comments – they are appreciated. I found in your painting the serenity of winter, at least I find the landscape serene. I could live here:) Beautiful, Mary. Thank you very much Elena – I’m glad it brings you peace. There is something to be said for very quiet places like this, gives us some perspective. Lovely to see you back Mary no doubt full of new ideas and thoughts for the year ahead . I feel being this scene you paint so beautifully here would bring roses to my cheeks 🙂 a real chill about it ! So great to hear from you again Poppy, glad to see you. I’ve got so many ideas and subjects to paint, I’d paint 24 hours a day if I could – but my husband would think differently about that. Glad you like the subject in this painting – it’s one of those scenes that I imagine drugging through the fluffy white snow. Have a wonderful New Year and all the best in 2014 – looking for lots of great photography from you this year! Another awesome painting Mary. No wonder you’re learning to bake bread. You need something warm out of the oven to counter your chilly scene. Happy New Year! Thanks Tim – Happy New Years to you! Last year we had only two days that dipped into the 20’s, this year we are number 28 and this coming week at night will be in the teens. Hard to believe this is Texas, but at least it’s not the minus teens that they are trying deal with up in IL and MN. Okay, so the warm bread is going to make a big difference, that and home made soup. Have a great weekend! Where is that dang global warming when you need it! So funny, oh yes the warming trend just keeps getting hotter by the day – no I’m sorry the year! Very nice looks like a spot in my yard 🙂 Nothing better than the smell of fresh bread baking sadly it is my known downfalls so I try not to have it except on special occasion 🙂 As a trucker traveling through all the major towns and cities I remember smelling all those fresh bakeries in the early morning hours thanks for jogging a lost memory Mary. Happy New Year! Thanks and Happy New Year to you! So glad the sound of baking bread brings back great memories of earlier times – the smell of it baking is unbelievable. Glad you like the painting, but I’ll bet you are tired of the snow and cold! Have a wonderful New Year. Your winter hillside scene is beautiful! And kudos to you for baking bread too. Wish I was there. Happy New Year and welcome back. Wonderful to hear from you Dorann, hope you had a nice holiday. Thanks for your nice comment, after 8 loaves I’m starting to get the hang of it – I’m liking the process, but loving the warm bread and butter, oh man does that sound bad?! I have to be really careful or I can see exactly what’s going to happen. Have a wonderful 2014 and looking forward to your writings!! Thanks Doron, great to see you again! Thank you for your beautiful comments and so glad you enjoyed this little painting. 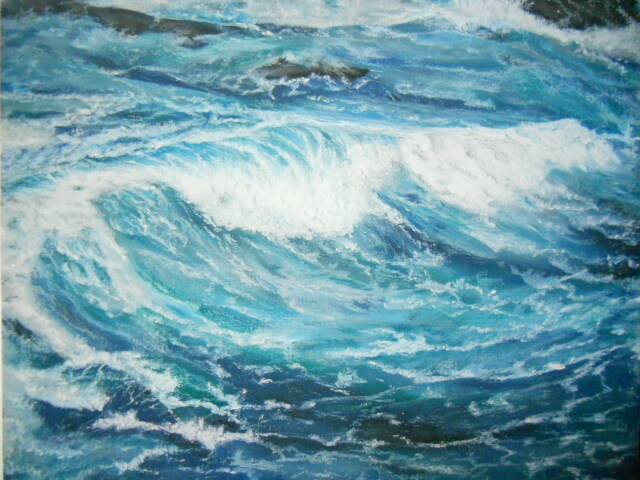 Stay warm the weather is awfully cold and snowy, lol it sounds like my painting. Looking forward to your new creations in 2014! Thanks Stefano – so nice to hear from you. Looking forward to catching up with your blog – have a fabulous year! Happy New Year Mary, lovely painting to start off with! Thanks so much Pink Saucer!! Very nice to hear from you – hope you have a wonderful 2014!! P.S. Looking forward to your beautiful new creations Divya!! Mary, Loved how we can see the texture of the canvas in this one…brings out the true chill of winter my friend. Glad to see you back. Hi Laurie, thank you so much – great to see you again. Only a few more snow scenes and then something more warmer, I think we could all use that after this very cold winter. Loved your Grandsons holiday pictures, he’s a real prize. Thank you Marina so much. Wonderful to see you again and I’m really looking forward to your new designs in the coming year – creativity is your second name! Nice to see your back. I also took off a week and it was a nice break. Thanks Annie – hope you had a nice holiday. Here’s to a new year and exciting new ventures. I love love love your paintings!!! you are such an inspiration!!! Now you have my admiration in the baking department, I am banned from the kitchen at home since I tend to set things on fire! So funny, listen you haven’t seen what the bread looks like – lol, but I’ve a lot of tenacity and going to keep trying! Thanks very much for your nice comments, very appreciated. I have a couple more cold scenes to show and then it’s going to be warm and sunny subjects. congratulations on juggling so many tasks! i love making bread – on a whim when i don’t feel like painting yet it gives me that ‘hand/eye’ connection. i make ‘skillet’ bread a lot and form the dough into a big flat pancake in the pan, let it rise, then cook it slowly, flip, cook more, flip.. then serve. i’ve not had an oven in a dozen years, so i’ve learned how to make those oven-foods that i sometimes crave for nostalgic reasons. the page did not load – victim of slow internet – but i’ve found that the reply to new post notice will at least stretch as a compromise! So wonderful Z to receive your message – missed our communication and your art! I’m very curious about making bread in the skillet (like a cast iron pan?) – I was just mentioning to my husband the other day that I thought that a cast iron pan might work. I’ve been baking on a baking stone. No oven for years? Oh man sometimes I wonder how you do it – obviously with no problem, because you’ve shown us some wonderful meals you’ve made and had had to adapt with what did you recently say, the blue colander and a wire, hanging outside the window for internet connection?